Google recently released Chrome 53 and claimed that its browser uses less CPU and GPU power consumption for video playback. Google posted a video with Surface Books showing its browser’s performance. Now Microsoft has conducted new tests. Microsoft has tested Edge, Opera, Firefox and Chrome battery life on a Surface Books, using the same Netflix test. According to Microsoft’s claim Edge lasted 8 hours and 47 mins, compared to 6 hours and 3 mins for Chrome. That’s 45 percent longer than Chrome, and 69 percent longer than Firefox. 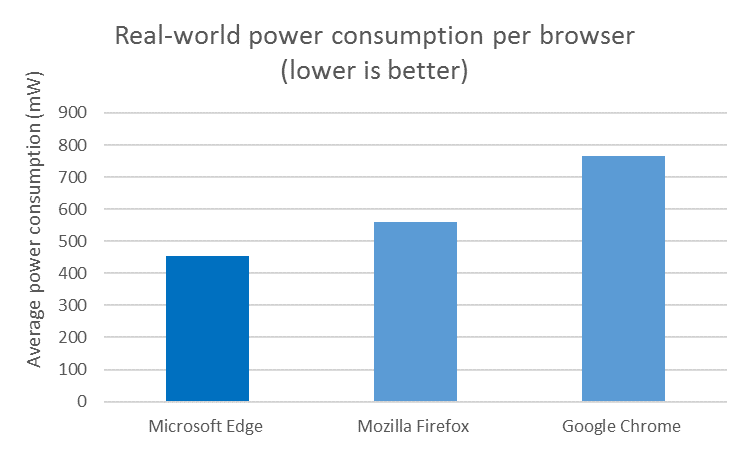 Opera comes second with 7 hours and 8 minutes of battery life, but Edge still lasts 23 percent longer.